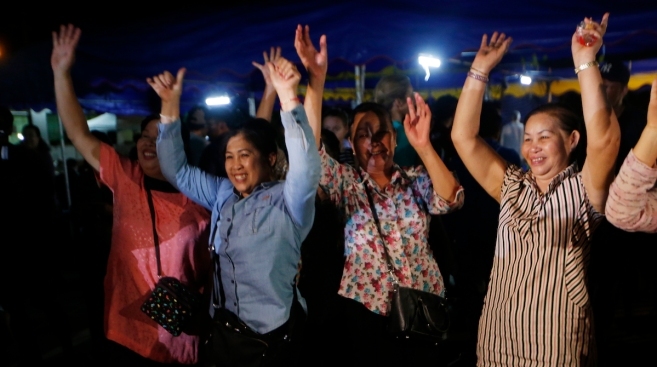 People celebrate after evacuation in Chiang Rai as divers evacuated some of the 12 boys and their coach trapped at Tham Luang cave in the Mae Sai district of Chiang Rai province, northern Thailand, Tuesday, July 10, 2018. Everyone made it out alive, in no small part, according to rescuers and sports experts, because they listened to their "Coach Ake"
The day-to-day pearls of wisdom imparted by coaches to players — from youth sports to high school, to college and even the pros — are well-known: Try your hardest, don't lose focus, support your teammates, keep your chin up. Everyone made it out alive, in no small part, according to rescuers and sports experts, because they listened to their coach, Ekapol Chanthawong, or "Coach Ake," and remembered the lessons athletes have been absorbing on soccer pitches, basketball courts and baseball diamonds for decades. "The role of sports is that sports skills become life skills," said John O'Sullivan, founder of the Changing the Game Project, which teaches about the value of sports in everyday life. "It's learning to work with others, depending on your teammates, trusting them. These things become life skills when they're intentionally taught through sports. These kids had to use these sports-life skills much sooner than they might have hoped for." The best in the coaching business are often those who master the art of subtly instilling habits that can carry over to different venues later in life. The general idea: Making a good pass won't necessarily lead to a win that day. But doing all the small things it takes to be a good teammate could have a profoundly positive effect down the road. "The lesson isn't always the outcome," said John Tauer, the title-winning basketball coach at Division III University of St. Thomas in Minnesota, who also teaches social psychology. "We talk about it all the time. We don't control the outcome. We control the effort and how we play together." In the case of the cave ordeal, he said, "it was, 'How do we get through the next five minutes together?' It was staying calm if someone's panicking. Doing all those little things put them in a situation where they could achieve that goal." He had also spent lots of time with the kids before the harrowing trip. The team's off-the-field adventures included cycling trips, river rafting, swimming in waterfalls and exploring caves. "Trust isn't just about his ability to coach soccer," O'Sullivan said. "It's about his connection to these kids. It's about being dependable, believable, vulnerable and all these other things. When you go into this situation where it's 'I'm going to try to save your life,' that's when trust really, really matters." The head of the U.S. rescue contingent, Derek Anderson, described the soccer team's survival and rescue as the ultimate example of teamwork. He said the boys were "incredibly resilient." "The lesson here is about doing things the right way, trusting that we're all on the same page, and then, at some level, it's rolling the dice," Tauer said. In sports, as in the cave crisis, "a leader tries to put you in a spot to do everything to the best of your ability. But then, you've got to trust."